This site allows you to easy buy and sell items using a quicker, and fairer way to determine the true value of an item. In addition to the above all items can be bought using paypal and/or picked up locally. Traditional classified ads websites have problems such as people who don’t show up to pick up the item, hagglers who beat the price down right up until the last minute of negotiations, and trollers who phone, waste time and never buy. 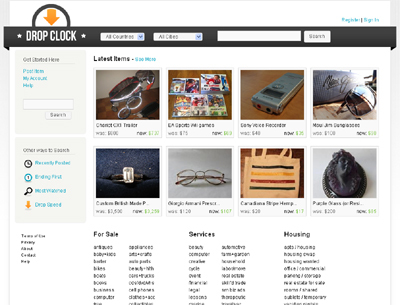 DropClock.com removes these problem areas from the classified ads website model.